This recipe is one of the few things I make that can actually be credited to a very specific source — Francis Moore Lappe’s Diet for a Small Planet, which convinced me to be a vegan some 22 years ago. Veganism didn’t last, but a life-long commitment to food and food justice certainly remained. Thank you Francis! I Googled the recipe (originally called Millet-Cauliflower Soup if you’re interested) in preparation for this post and was not-too-surprised by how different mine has become through the years. However, the toasty millet soup base featuring miso, blended nuts & nutritional yeast make mine a certain echo of the original. Ah, turnip greens. For some, the strong flavor is enough of a turn-off to relegate these greens to the chicken’s aliquot – Egad! It is precisely this bitter flavor that indicates incredibly high calcium — more than any other cruciferous green. 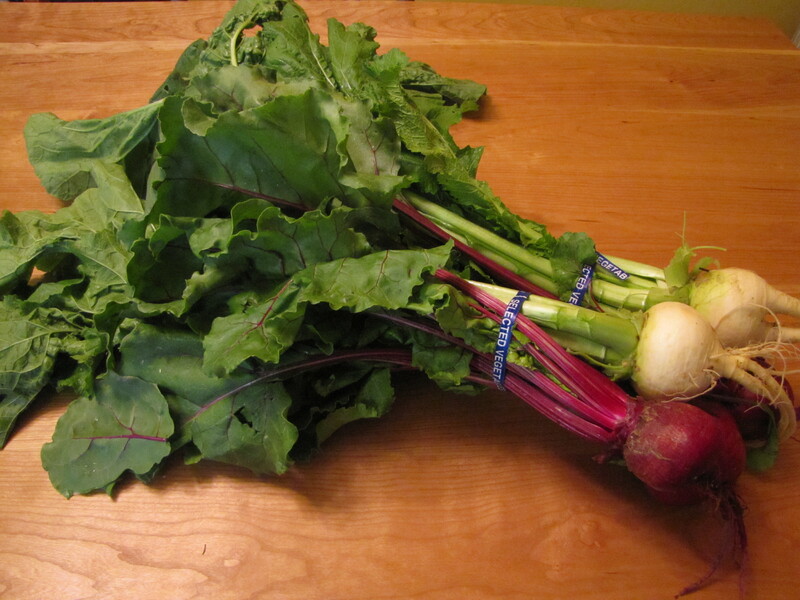 Turnip greens also outscore all the other greens for glucosinolate content. This sulfur-containing compound (responsible for that other off-putting flavor of these greens), when metabolized has been shown to be both cancer-preventive and cancer fighting. And if that isn’t enough to convince you, they also have outstanding levels of vitamin K (662%DV in one cup cooked…HELLO perinatal nutrition!). Need I say more? How about this: they’re delicious when cooked with a little care. Young turnip greens are actually quite delicate in comparison to their older brothers and sisters and don’t need to be handled with any particular technique; simply use them as you would any other green. As they mature however (and develop more of those life-giving nutrients! ), things get a bit more prickly (quite literally). Don’t worry about the prickles; these go away completely when cooked. To use as a simple green (i.e. braised without a whole lot of other ingredients), I recommend a salt water soak for 20-30 minutes followed by a good rinse. After braising, finish with whole butter or a bit of cream to further mellow those strong flavors. Turnip greens also go beautifully in soup! My favorite soups for turnip greens are Italian Wedding Soup and this Turnip, Millet & Cauliflower soup. The latter of course was requested first so here we are! Begin by heating a regular 6 quart stock pan over medium-high heat. Add the millet and olive oil; cover. With oven mitts, (as if you were making popcorn) keep lifting and shaking the pan every 20 seconds or so until the millet really starts popping and smells deliciously toasty. Pour in enough water to cover by about an inch (2-3 cups) [WATCH OUT — It will really STEAM!! ], add turnip stems and garlic, cover and simmer over low heat for about 20 minutes. Add about 6 cups of water, your chilies, green pepper, turnip bulbs, cauliflower core, miso, bouillon & tamari. Increase heat; bring to a simmer. After about 5 minutes, add your cauliflower florets and some more water (4-6 cups — enough to bring liquid up to about 2 inches from top of pot). When it comes to a boil, reduce heat and simmer for an additional 5-10 minutes until cauliflower and turnips are almost done. Add all the greens to finish cooking for an additional 2 minutes or so. Meanwhile, blend the raw nuts and brewers yeast with about a cup of water. 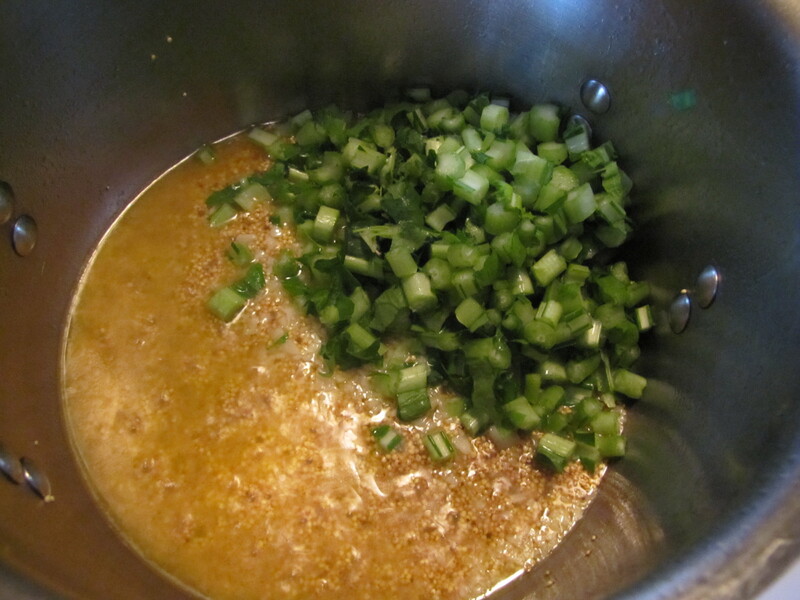 When the greens are done, add this to the soup and turn off heat. Add mineral salt, pepper, a little fresh nutmeg & some fresh or freshly-dried herbs you have on hand, to taste. I like mint with this soup very well, but this last time all I had around was lemon balm and it was delicious! Chervil, parsley, cilantro & dill are all also quite. Invite your favorite vegans over and enjoy! I must credit the good folks at the World’s Healthiest Foods (whfoods.org) for some of my information on turnip greens, some excellent Spanish turnip researchers (at Mision Biologica de Galicia) for information about where the tastes come from and of course Wikipedia’s many for the lovely glucosinolate info. ← I think I’m turning green!